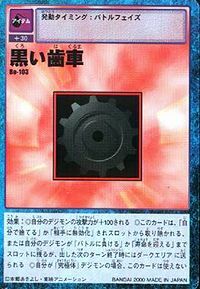 A Black Gear (黒い歯車 Kuroi Haguruma) is a device made by Devimon to control other Digimon, often sending them into an angry, berserker rage. The Evil Rings later created by the Digimon Kaiser share a similarity to them. This page was last modified on 30 April 2013, at 11:51.